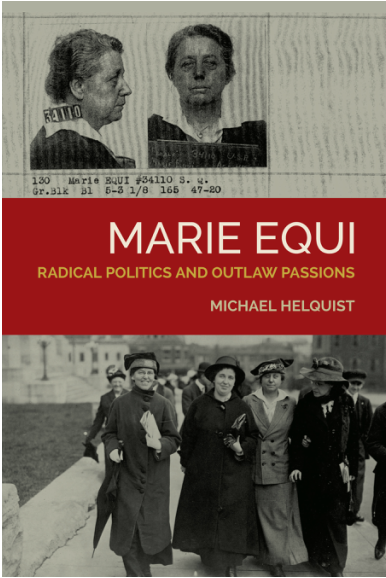 MARIE EQUI Radical Politics and Outlaw Passions presents the life of a fiercely independent, fearless woman. Marie Equi (1872-1952) endured childhood labor in a gritty Massachusetts textile mill before fleeing to a Western homestead in the 1890s. In her 20s Equi first claimed headlines for publicly horsewhipping a school superintendent over a pay dispute with her girlfriend. Her commitment to social justice and her willingness to protest defined the rest of her life. Equi self-studied her way into medical school and became one of the first women physicians in the West, a remarkable achievement for a working-class woman. She earned a medal from the US Army for her heroic assistance to earthquake victims in 1906 San Francisco. She then engaged in the progressive, and later radical, struggles of her day – woman suffrage, workers’ rights, fair pay, and reproductive rights. She mounted soapboxes, fought with police, and spent a night in jail with birth control advocate Margaret Sanger. She marched so often with jobless men that the media referred to them as Equi’s Army. When she protested World War I, the government convicted her of sedition and sentenced her to San Quentin prison. The life of Marie Equi resonates with the political dissent and protest of today when the obstacles to justice seem so great. Like so many people now, she struggled to balance her activism with her personal and working life. MARIE EQUI gives an intimate look into the life of both dissent and affirmation, leaving readers inspired and motivated. Reviews Declare MARIE EQUI "A Page Turner" and "A Must Read"
The Seattle Lesbian, by novelist Lisa E. Davis, Under the Mink “Intense and superbly crafted biography"